I was raised in the southeast and lived half of my life there. I'm told that I still have a pretty heavy southern accent. I listen to some country music, but over the past few years my taste have switched to classic rock (it wasn't classic when I first heard it). I'm told a lot of red neck jokes and I spread around a few myself. This little fellow in the picture is no joke though. He's a red-necked grebe. He gets his name from his plumage. Once he's an adult, his neck will be covered with red feathers during the summer. He'll also be a great swimmer. You'll only see his head and neck out of the water when he swims. He'll also be a great diver, propelling himself deep with his lobed toes as he pursues fish, crustaceans, and aquatic insects. Then when he has young ones himself, he will carry them on his back when he swims. 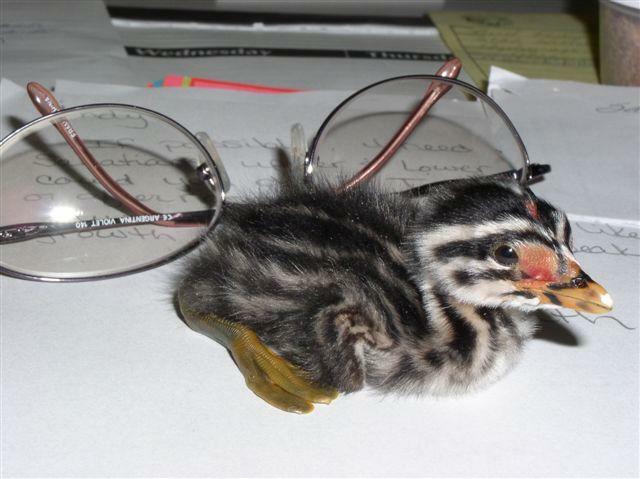 We don't know for sure how, but this little guy got separated from his parents on a weekend when Bird TLC was closed. It was taken to Pet Emergency Clinic which is open 24/7/365 which takes the birds in until we open up. In the lower 48 states, wetland habitat loss is the major factor contributing to population decline. The alteration or destruction of wetlands eliminates nesting habitat. Conservation of large inland wetland complexes is critical to the stability of red-necked grebe populations. In the United Kingdom, breeding has been suspected but the potential sites are kept secret and birds given special protection. Fewer than 20 individuals spend the summer in the UK each year, with numbers increasing slightly in the winter when birds move there from colder Europe. 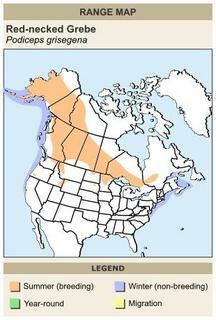 In Alaska (and all of the U.S.), it's protected by the Migratory Bird Treaty Act of 1918. 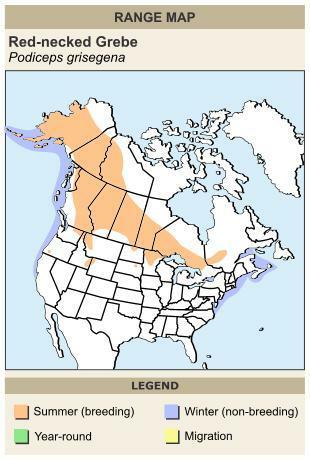 By the map to the right you can see that the red-necked grebe spends it summer inland near large lakes breeding ( below the Arctic Circle), and winters on the southern coast. This little guy will be spending most of it's summer with Bird TLC and one of it's Baby Bird Mom's. Once he gets his juvenile plumage, he'll be released at a local lake where other grebe's are. Hopefully from there he can learn from watching others. I found lots of links on red-necked grebe's, but none talked about life span expectations. Here's hoping he enjoys a long life from there.